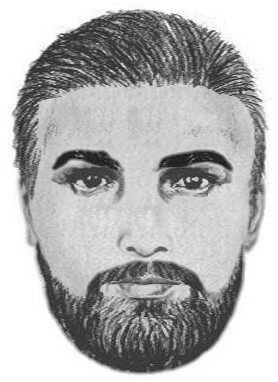 Ontario, CA – The Ontario Police Department is continuing its search for a man who committed lewd acts at Creekside Park yesterday. Several juveniles reported seeing the male who had exposed himself while in the park that morning. One juvenile female reported the suspect reached out and physically touched her as she walked by, however he was not exposing himself at that time. Additional information has been received that the suspect may have committed similar acts at this location in the past. Investigators were able to complete a composite sketch of the suspect and are asking for the public’s help in identifying the man. He has been described as a mid 30’s light skinned male with a beard and medium length dark hair. He is 5’3 – 5’5 inches tall with a medium to heavy build. He was last seen wearing jogging attire consisting of a black sweatshirt, red t-shirt, and black or gray shorts. His vehicle is a tan or gray older model sedan similar to a Toyota Camry or Honda Accord. Police are asking anyone with information to contact Detective Fred Alvarez at 909-408-1845. Information can also be reported anonymously by calling WE-TIP at 800-78-Crime or on-line at www.wetip.com.